I know what you're thinking, but this has nothing to do with anybody leaving the seat up. What I'm referring to is the difficulty we've had replacing our old toilet seat. The bolts were so rusted that the plastic nuts would not budge at all, no matter what we did to them. So after much cursing & elbow grease with a variety of pliers & wrenches, we gave up. 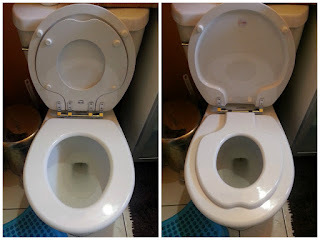 I can't remember how many weeks or months passed, but now we've started toilet training, the need for a new seat is more pressing. Unsurprisingly, I'd prefer Sprout go directly into the toilet rather than using a potty that I then have to pick up & empty into the toilet. I'm familiar enough with my child's poo as it is & I would love to never have to see any again. So why did we need to replace the seat? Quite a while ago we found a Bemis NextStep seat that has an integrated toddler seat in it. I'd seen it at my midwives' office a few years ago & thought it was brilliant. So I went in for round two (or possibly three) with the rusted on seat. In my arsenal were the tools you can see at right: tin snips, a box cutter, a tiny chisel, a hammer, needlenose pliers & a hacksaw blade. I'm not even joking. I used every one of those tools on it. Also my phone, for a flashlight. The technique that worked best was to chisel through the bolt so it would open up enough to then unscrew over the rust. Seriously awkward work in such a cramped space as our bathroom. Guh. But I did it. Installing the new Bemis NextStep seat was a piece of cake Amazing how well bolts & nuts work when not rusted all to hell. 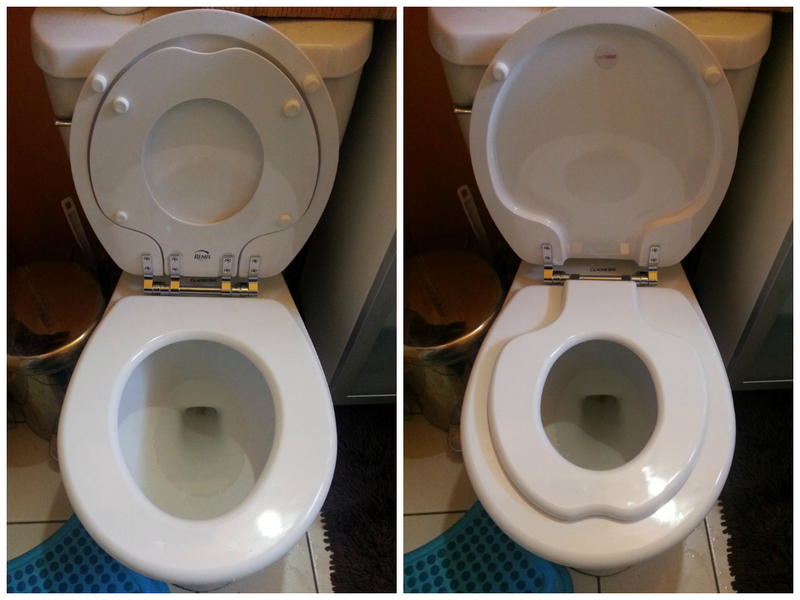 As you can see in the photos, the little seat folds up into the lid, staying secure with a magnet, when adults are using the loo. When Sprout needs to go, he runs in, pulls down his seat & hops on with the help of a small step stool. It's the perfect size so that he can no longer fall in & he feels secure up there. He seems to like it & has actually been on it probably a dozen times today. We bought the Bemis seat at Home Depot, where it's currently listed online at about $45. I think it was on sale or a slightly different model, because we only paid $36 for it. That's probably more than we would have paid to buy a regular seat & a little plastic potty seat, but this is easier for Sprout to use, so I think it will be worth it. Do you know the actual model #? Sorry! I don't have the model number & can't seem to find the exact seat online anymore. That looks like it--thanks for the links!